Muay Thai is one of the most well-known style of martial arts to come out of Southeast Asia. However, another full-contact combat sport named Lethwei rivals and may even be more deadly than Muay Thai. MMA Life has previously published an article titled “The Burmese Martial Art of Lethwei” that gives a short but detailed overview of Lethwei. The following content compares the two brutal combat sports of Muay Thai and Lethwei, and also evaluates how well their training regimen and technique transfer to MMA. Lethwei is also known as Burmese bareknuckle boxing and was developed before Muay Thai. Lethwei is believed to be created over a 1000 years ago in Burma. Muay Thai and Lethwei focuses on the stand-up aspect of hand-to-hand combat. Watching these two sports you will see great similarities in their stance and striking techniques. The video below illustrates how fighters from these two martials arts use a square stance and a marching rhythm. In addition to the stance and movement, these fighters tend to distribute most of their weight towards the back leg so they can be light on their front leg. The purpose of this weight distribution is the ability to quickly react with the front leg to check kicks or to perform techniques like push kicks. In this video, a Lethwei fighter is pitted against a Muay Thai fighter. Watch the similarity in their poses as they are getting ready to launch their attack. The martial art of Muay Thai is known as the “art of the 8 limbs” due to its striking techniques consisting of punches, elbows, kicks and knees. However, Lethwei expands on this by including those previously mentioned techniques as well as allowing their practitioners to strike with their head, therefore giving Lethwei the name of the art of the 9 limbs. The inclusion of headbutts provides a realistic component and devastating tool that would be useful in a street fight where rules and restrictions do not exist. An example of how effective a headbutt can be in a competition scenario is shown below. Lethwei fighters commonly set up their headbutt attacks with punching combinations as they shorten the distance between themselves and the opponent. The video shows that a Lethwei fighter can also do massive damage to their opponent by launching forward with a headbutt. Another element that makes Lethwei the more violent combat sport is their lack of hand protection. Currently, Lethwei competitors wear the same gear as Muay Thai practitioners, except their hand protection only consists of gauze wrap and tape. They do not wear any gloves that is commonly seen in international boxing and kickboxing events. The images below compare the attire and equipment worn by these two respective martial arts. 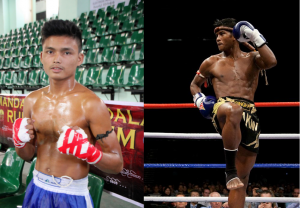 The image on the left is a Lethwei fighter and the right is the famous Muay Thai fighter Buakaw. Without the use of padded gloves, the chance of breaking your hand is much greater in Lethwei as well as getting cuts from punches. Clinching techniques are allowed in both combat sports, but referees will break up the two fighters if there is any inactivity. Referees for Lethwei matches seem to have a lower tolerance for clinching action and are much quicker to separate the fighters compared to the ones in Muay Thai. Of course, whenever either fighter hits the ground, the referee will immediately reset the fighters’ position. In clinching situations, the fighters can throw devastating elbows, knees and in Lethwei’s case headbutts. The clinch also provides a powerful tool in disrupting the opponent’s movements and taking them down. These martial artists can also catch kicks and use it to counter their opponent. 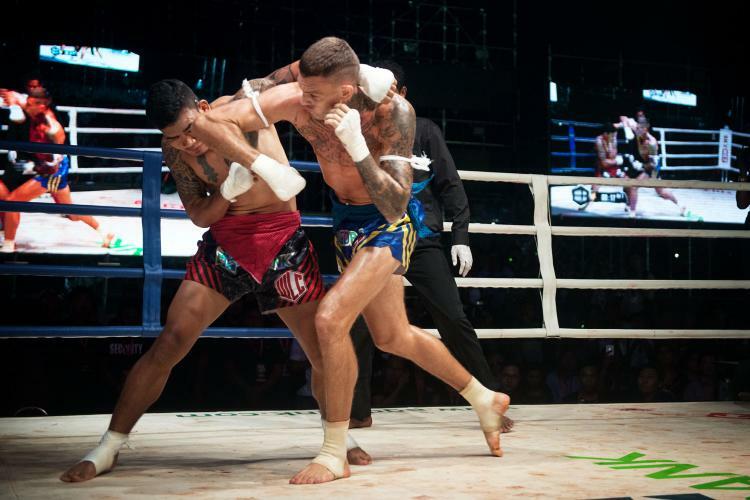 In an attempt to grow Lethwei globally, Lethwei organizations changed some of its traditional roots to meet what is commonly seen in the international combat sport scene, such as stricter rules and replacing sandpits with a boxing ring. Previously, Lethwei matches lasted until only one fighter was left standing. Now, Lethwei has 5 3-minute rounds like Muay Thai. While Muay Thai uses a point system for scoring the fights, Lethwei has their own unique and more “primitive” rule to win. Lethwei fighters have to knockout their opponent or cause them to withdraw from the match due to an injury within the 5 rounds time frame. Otherwise, the match ends in a draw. Muay Thai’s scoring system weighs kicks more than punches, so this type of attack is heavily favored in their matches. Due to Lethwei lack of a scoring system, their fighters tend to incorporate punches more in their striking combinations. Lethwei also has an injury timeout component that does not exist in Muay Thai. This injury timeout rule lets the cornermen revive their fighter that otherwise would not be able to continue in a standard Muay Thai fight. Due to this injury timeout as well as Lethwei’s rules to win and the fighters not wanting to receive a draw result, Lethwei fights can be more aggressive, bloody and reckless compared to Muay Thai. In addition to that, Muay Thai competitors tend to use the first round to feel out their opponent and ease up in the fifth round as well. Lethwei fighters cannot do the same because their rules and culture discourage any attempt to not be aggressive. Otherwise, they can be punish with a humiliating decision by the referee to stop the fight due to lack of aggression by both fighters. Muay Thai techniques have been effectively implemented in MMA by high caliber fighters like Donald Cerrone and UFC champion Joanna Jedrzejczyk. A large portion of Muay Thai’s arsenal translate well to MMA. The one big advantage Lethwei has over Muay Thai in relation to MMA is how Lethwei fighters are used to fighting without thick boxing gloves. Those who have done MMA sparring knows the big difference going from sparring with boxing gloves to punching with MMA gloves. Unlike boxing, MMA gloves have less padding to hide behind. Therefore, it requires more movement and structurally sound defense. Those aspiring to compete in MMA will have to break the habit of hiding behind thick boxing gloves, since it is no longer a viable option in actual MMA combat. Therefore, a Muay Thai practitioner transitioning to MMA must adjust their striking defense to adapt for this while Lethwei fighters are already used to it. Two fighters that have successfully translated their Muay Thai techniques to MMA. The negative aspect of a Lethwei fighter transitioning to MMA is that their time dedicated to headbutt strikes could have been used to sharpen other striking techniques that are legal in MMA. Furthermore, their aggressive and reckless fighting style can cause them to be out of position and more exposed to being taken down. While the martial arts of Muay Thai have gained prominence in MMA, we have to wait and see what the future holds for Lethwei.